What made us decide to start this? Launching off on the 4.5 mile course from Volz's Landing. 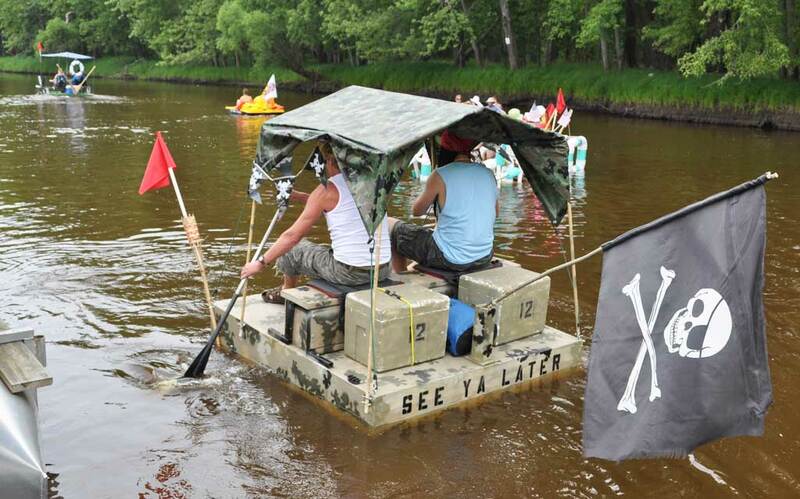 The idea for a raft race came from one that was sponsored by a local radio station (WKAU) on the Fox River between Appleton and Kimberly until 1985. A few of us had been talking about the idea of starting up another raft race for a couple of years when my sister Kari Deimer died from a rare and aggressive form of cancer. The idea of the raft race evolved into an idea to have many of Kari’s friends and family (as well as people who never got the privilege of meeting her) get together, start an annual community event, and raise money for cancer research. The old raft races were always fun, challenging and could be a family event. We hope to do the same with this race and improve it every year! *If you would like to try the 'endurance class, please meet at Damn Yankees at 8:30am for register. Your team will take off with the canoe and kayak class at 9:30am. You will still be eligible for a 1st place trophy. *A shorter (approximately 4.5 mile vs. the 11.5 mile) main raft race. We will still start the canoes and kayaks from Damn Yankee’s Watering Hole at the Buchman Access boat landing. Start times: Kayaks and canoes (and endurance homebuilt) will start at 9:30am on the 11.5 course from Damn Yankees. (Registration will be from 8:30am-9:00am, with a mandatory participant meeting at 9:15am and launch at 9:30am). The raft and commercial classes will start at 10:30am at Volz's private landing (about 4.5 miles from The Waters Supper Club in New London). (Registration will be from 9:00am-10:00am, with a mandatory participant meeting from 10:15am and launch at 10:30am). Finish line for all classes will be at The Waters again. We’re hoping to have everyone off of the river by about 5:00pm. ROOKIES BE ADVISED! AVERAGE SPEED FOR RAFTS FOR THE 2011 RACE WAS ABOUT 1.5 MPH! Water levels were average to a little high for July in 2011. Lower water level = longer race! *Official race numbers will be assigned at registration. Numbered flags will be given to each raft at the starting line. The raft’s finishing position will be determined by the order that the flags are turned in to the official at the finish line. Any number can be displayed on the raft anywhere, but the official race number will be the one on the flag. Canoe – Crew of 2 or more - 11.5 mile course. Kayak – teams of 2 - 11.5 mile course. Homebuilt Raft – 4.5 mile course, homebuilt. (NO commercially available hulls of any kind). Homebuilt Endurance Raft - 11.5 mile course, homebuilt. (NO commercially available hulls of any kind). Commercial Raft – 4.5 mile course, Inflatable rafts, pedal boats, etc. (No rowboats, fishing boats, etc.). Crash & Burn – for the raft that seems least likely to finish. Kari Deimer Memorial Award – A “Judges’ choice” award for a raft/crew that is memorable because of it’s artistic uniqueness, unusual theme, clever design, exceptional sportsmanship, or in any other way displays the spirit of this event in an exceptional way.